In an upstairs ballroom of downtown Seattle’s Arctic Club, where polar bears and maps of the Arctic decorate the walls, volunteers and activists who campaigned for Washington’s first carbon fee waited cheerfully for election results on Tuesday night. Just after 8 p.m., a first wash of returns that had the initiative on track to pass sent ripples through the room. But as more counties reported in, the likelihood dropped. By 9 p.m., the mood turned, and clusters of supporters retreated to bars across downtown to mourn. On Wednesday morning, 56 percent of Washington voters had rejected the state’s second attempt to tax carbon emissions. As the U.S. has stepped back from federal commitments to limit carbon pollution, activists have called on states and local governments to fill the void. It’s an approach that could prove effective, according to a report released in September by Data-Driven Yale: Existing state, local and corporate commitments could take the U.S. halfway to meeting its Paris Agreement goals, designed to limit global warming to 2 degrees and avoid the most catastrophic effects. Tuesday night’s returns offered a mixed message on whether states have the momentum to regulate fossil fuels without federal backing. Candidates who support action on climate change won gubernatorial races in Colorado and Oregon, while in Washington, Democratic incumbent Sen. Maria Cantwell, who has backed climate initiatives in the Senate, held her seat by a comfortable margin. But ballot initiatives intended to regulate fossil fuel emissions and boost renewable energy sources fell flat. 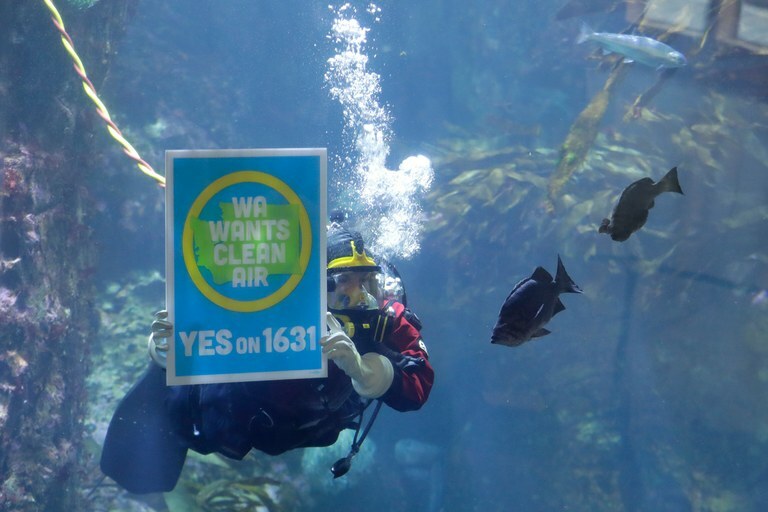 Diver Kim Thomas holds a “Yes on 1631” sign as she dives in a large aquarium display at the Seattle Aquarium. Initiative 1631, which was crafted by a coalition of labor, social justice and environmental groups and tribal nations, would have taxed every metric ton of carbon produced by most of the state’s largest polluters at a rate of $15; some sectors were exempted, including fuel used in agricultural production and coal plants slated for closure. A prior initiative to tax carbon emissions while lowering other taxes and boosting low-income tax credits failed in 2016. The 2018 initiative, which would have used the funds raised by the tax to pay for climate mitigation and response, drew well-funded opposition from oil and gas interests. The result: Projected to fail. Only three counties, Seattle’s King County, Port Townsend’s Jefferson County and the San Juan Islands, voted for passage. Proposition 127 would have required electric utilities to purchase 50 percent of their power from renewable sources, such as wind and solar. It excluded nuclear power as a renewable source, which stoked fears that its passage would lead to the closure of the Palo Verde Nuclear Generating Station. A lawsuit from the state’s largest utility muddied Proposition 127’s progress to the ballot, while out-of-state money helped make it the most expensive proposition in state history. A group backed by California-based billionaire Tom Steyer’s political action committee, NextGen Climate Action, poured $23.2 million into efforts to pass the initiative; Arizona utilities, as well as the Navajo Nation, spent nearly $30 million to oppose it. The result: Failed. As of Wednesday morning, 70 percent of voters had rejected the measure. A pair of dueling initiatives, Proposition 112 and Amendment 74, dealt with regulating the state’s fracking boom, which has butted up against sprawling suburbs. Proposition 112 would have required new oil and gas wells and production facilities to be built at least 2,500 feet away from schools, drinking water sources and homes, a significant increase from current set-back requirements. Amendment 74 would have required payments for any lost property values due to government action, including regulations that affect mineral rights – like Proposition 112. The result: Both initiatives failed, leaving the state where it started on oil and gas regulations. The ballot in Nevada also had a pair of dueling measures to reshape the energy market. Question 6, which was also backed by Steyer’s NextGen Climate Action Committee, mandated utilities purchase 50 percent of their electricity from renewable energy, as in Arizona. Question 3, meanwhile, was more complicated: It would have opened up the energy marketplace, so consumers could purchase the cheapest energy available. Environmental groups argued it would have eroded clean energy development; the measure’s backers argued the opposite. Question 3 drew millions in out-of-state money; opponents outspent the measure’s supporters three-to-one. The result: Nevada proved a bright spot in the region for clean energy action. Question 6 passed with nearly 60 percent of the vote, while Question 3 failed.